As Winter Approaches, Protect Your Skin! As the fall season nears its end and winter slowly approaches, it is essential to protect your skin during the colder weather. It is very common for people to forget about sun protection during the winter becauselet’s face it--most of us are trying to avoid the cold weather by staying inside. An NBC Women’s Health article recently revealed that your body registers every minute you spend in the sun. This means that sun damage to your skin is something that can occur all year round, regardless of the season. To protect your skin this winter it is essential to exfoliate and moisturize your skin. All of Restorsea’s products are natural exfoliants as our enzyme eats away at dead skin. Make sure to incorporate our products in your daily skincare routine to maintain the best skin this winter! Being healthy means staying in shape physically, but also emotionally. The effects of stress and mental fatigue on the body are enough to warrant activities dedicated solely to repairing that damage. I’m a big proponent of Restorative Yoga for that very reason. Another solution that works wonders (and that feels great) is a deep tissue massage—a special type of bodywork that works deeper layers of muscle and connective tissue using various techniques to promote recovery and relaxation. I go to the Exhale Mind Body Spa at the Gansevoort Park Avenue for mine (ask for Fernando). I’m feeling more relaxed just thinking about it. Research studies have discovered that poor sleep habits can accelerate the signs of aging on skin by weakening the ability of our skin to repair itself at night. Pump the brakes on aging by following these simple tips to form better sleeping habits! Consistency is key! Try to develop a sleep schedule where you go to bed and wake up the same time every night. It might be harder to stick to during the weekends, but at least during the weekdays you can train your body to become accustomed to a set schedule. It will help you feel much more alert when you wake up in the morning and have a better rest at night. Yoga at Night. Yoga isn’t just for early risers! Try devoting half an hour before bed to yoga or basic stretching. Studies show that relaxing exercises such as these can help improve your sleep. Stay away from caffeine! Research shows that caffeine can have effects on your sleep up to 10 hours after drinking it. If you’re looking to have a cup of tea or another beverage before bed, make sure to keep it decaf. Recover lost hours over the weekend. Our schedules during the week are usually packed and sometimes getting a full 8 hours just seems like a luxury. If that’s the case, prioritize sleep on the weekends and catch up on all the lost hours from the week. Following these simple suggestions will help take care of your face, body and mind. At Restorsea, we pride ourselves on achieving beautiful, healthy skin by using only the best and safest ingredients in all our products. While we are very aware of the chemicals that one should always avoid, in beauty products we also know oftentimes many consumers tend to forego reading labels and will only quickly glance to check what’s inside their skincare products. Dangerous chemicals can hide in even the most common beauty products, here’s three harmful ingredients that we make sure to stay away from and ones you should too. Cadmium: We would all love for our foundation to perfectly match our skin tones, but before you begin putting on your powder, check to see if your daily go-to beauty product might contain cadmium. Cadmium was found prevalent in foundation powders across several beauty brands according to the FDA. An earlier research report by the Journal of Chemical and Pharmaceutical Research found that cosmetic companies were using cadmium to create colors in many of their products, most prominently in nail polish also. As with any chemical, high exposure to cadmium is never healthy. Lead: If you're like most people, lead is something recognized as being used in pencils (as it should be). But when you think of a beautiful tube of red lipstick, the last thing you’d expect to be hiding underneath that alluring shade is lead. However, reports have found that this is all too often the case in many drugstore lipsticks. Shockingly, the FDA conducted a research study in which they found lead contents present in almost 400 lipstick brands. According to SafeCosmetics.org, the FDA warns that in a worst-case scenario, high exposure to lead can lead to learning and behavioral problems. Before you walk away with a cool shade of color for your lips, next time at the drugstore make sure you check the ingredients to ensure that you’re not walking away with a toxic lip. 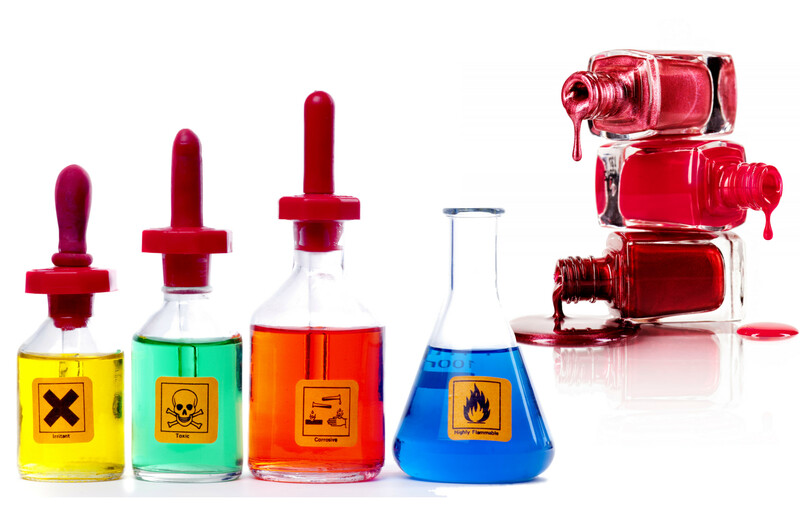 The above chemical products are the most commonly found toxins present in beauty products and, according to research, exist only as byproducts. While that may be so, at Restorsea we like to play it safe and make sure we’re using only the purest, safe, and natural ingredients in our skincare regimen. Take a look inside your beauty bag and see what’s inside your makeup products, or opt for an organic, all natural product that contains no harmful chemicals. Remember that you always want to keep the amount of exposure to chemicals to a minimum in order to keep your skin healthy, glowing, and beautiful!